On my first trip to Lisbon, Portugal I wanted to include a beach town on my list. I saw some awesome photos of Cascais and I was sold! 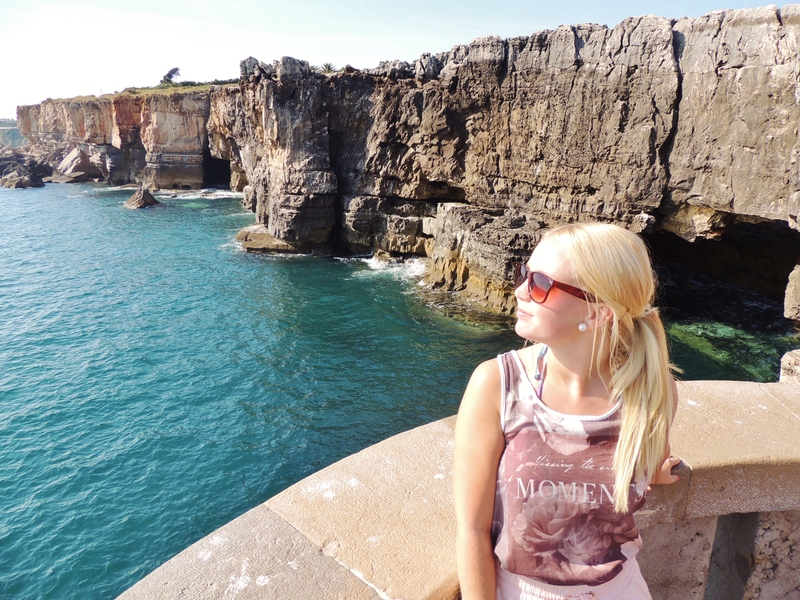 Here are what I was able to experience in Cascais during one day! Cascais is a beautiful beach town 40 minutes train ride from Lisbon. The price is around 2€ per way so it’s suitable also for low budget (like mine!). In Cascais you can spend your day laying on the pretty beaches and adoring the sun but I’m telling you that don’t miss a visit to the fortress of Cascais and Boca de Inferno, the Hell’s mouth. The medieval fortress of Cascais is located near the city center. Entry is free of charge and from the top of the fortress there is a beautiful view over the Cascais harbor. It’s a perfect place for taking pictures so don’t forget to bring your camera! Only downside is that the texts about the history are only in Portuguese so better to have a translator with you or read the history beforehand from the internet. The fortress is conveniently located on the way to Boca de Inferno which is 1,5km from the city center. The Boca de Inferno is a place where steep cliffs rise from the ocean. It’s rugged view is stunning when waves hit the rocks and the sea rumbles. The name Boca de Inferno comes from the area’s dark past. Boca de Inferno is sadly known as a place for suicides. The harsh waves hit the rocks powerfully so the chance of survival after a jump is not very high. Nowadays Boca de Inferno is a popular place to visit in Cascais not for the dark past but for the breathtakingly beautiful rock formation. There are few cafées located nearby so you can get some refreshments before heading the 1,5 km back to the city center. In Cascais if you don’t wish to travel by foot you can also rent a bike. It’s also an easy way to get to Boca de Inferno or even further. The scenery will be worth it! The center of Cascais isn’t very big so walking around will be the easiest and most convenient way. If you have more time in Cascais than one day you can also visit Estoril which is a city within easy reach by walking alongside the coastline. This was only a scratch of what Cascais has on offer so go and explore these amazing towns! Don’t forget to check out my Lisbon and Sintra experiences!